Amnesia Haze is a marijuana strain that’s not so easy to cultivate. It needs a lot of sunlight and warmth to flourish. The climate needs to be Mediterranean, mild and sunny when growing this cannabis outdoors. If cultivated outdoors, the strain of cannabis requires a climate where the temperatures are consistently between 72 to 80 degrees. This strain is extremely sensitive to pests. So, it’s much easier to grow it indoors. As an indoor plant, the limbs grow more horizontally than they do vertically. This allows the plants to grow into bushy physique, generally less than 3-4 feet in height. These plants require plenty of light and air to reach the nodes flowering on the lower branches. Therefore, it’s vital that you trim the wide leaves at the top of the plant. Because it takes such a long time to fully mature, this is not necessarily the best strain to grow for profit. 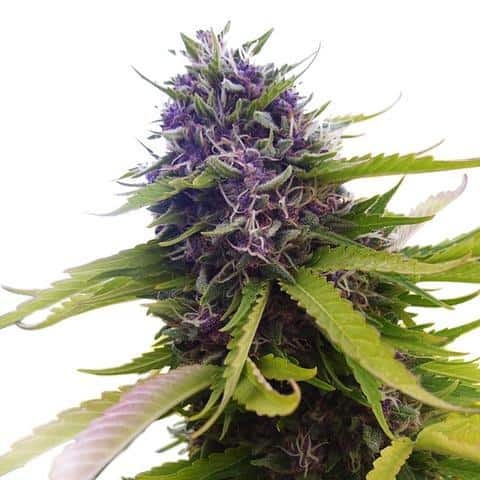 Amnesia Haze can take between 10 to 12 weeks to flower, making it a bit hard to produce on the retail market. For personal cultivation, these plants can be raised from Amnesia Haze seeds or as clones produced from bud clippings. One great benefit of the long flowering time is that each plant can produce about 2 ounces or 60 grams of usable cannabis per square foot. Those who use Amnesia Haze enjoy a happy high, with a slight light-headed euphoria. However, there’s no absence of productiveness, as this strain brings out the creativity in users. You’ll feel both uplifted and relaxed at the same time, while feeling excited… like you’re floating on the clouds. 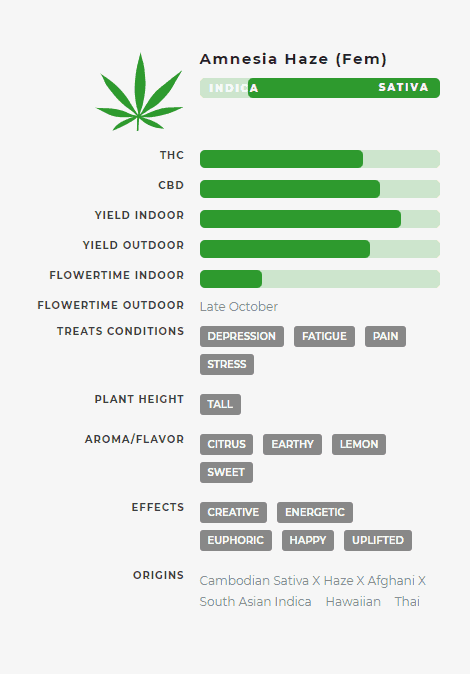 It has been measured with THC levels up to 21%.